The snow has melted. We have new songs. We need your support for organically grown, all natural, local music. We love our audience. Please buy tickets now for our concert this Friday in Berryville. Last time we played the Barns of Rose Hill was just over a year ago. We sold the concert out with 235 people in the house. This time there will be fewer seats available due to fire regulations. We can’t wait to play for you! 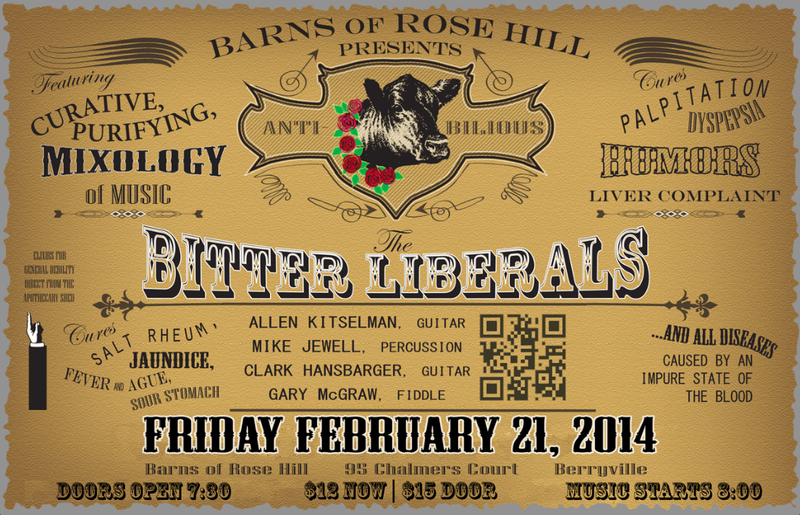 This entry was posted in band, bitter liberals, gig, original music, poster and tagged berryville, bitter liberals, concert, conga, entertainment, fiddle, guitar, local music, music, new songs. Bookmark the permalink.